Everybody wants to have an Android phone. But the high prices of Android phones do not let the common people reach the technology and innovation that have been marked by the development of Android. To let the common people reach latest mobile technology development, Motorola has launched Motorola Fire, a touch and type phone with Android Gingerbread OS. Powered with 600 MHz processor, 256MB RAM, and 512MB ROM, it offers smooth performance. It has 2.8” capacitive touchscreen TFT display. The Gingerbread device offers good connectivity with Wi-Fi (802.11 b/g/n), 3G (HSDPA, 7.2 mbps, HSUPA, 384 kbps), and Bluetooth (v2.1 with A2DP & EDR). It provides tethering and portable Wi-Fi hotspot options. The phone supports multiple audio formants and features FM radio. It has 3.5mm standard audio jack. The phone negates when you are looking for a camera phone. It has poor camera quality - 3MP resolution, 4x digital zoom, and fixed focus. However, you can capture average quality picture outdoor in good lighting condition, which you can upload on social networking sites such as Facebook. It is also capable of video recording @24fps. 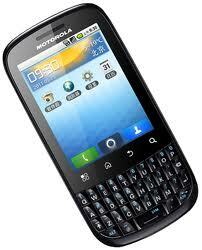 Motorola Fire also features e-compass, proximity sensor, ambient light sensor and accelerometer. Your dream to own an Android Gingerbread phone will be now fulfilled without extending your budget. Visit Saholic to buy this phone. good phone for the price it is available. what one can expect more than these features at this price..